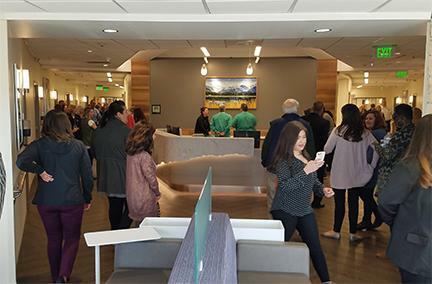 AURORA — The Rocky Mountain Regional Veterans Affairs Medical Center in Aurora will open its doors to inpatient veterans on August 4, 2018. Designed to transform the patient and family experience, the new 1.2 million-square-foot campus includes a four-story concourse, research facilities, diagnostic and treatment buildings, inpatient treatment buildings, and clinic buildings. The new facility replaces the current 670,000-square-foot Denver facility. The state-of-the-art facility will serve more 390,000 veterans and will offer services including a 30-bed spinal cord injury clinic, aquatic therapy, mammography and PET scans for cancer and prosthetics, as well as expanded telehealth services, polytrauma and a traumatic brain injury unit. The hospital also includes 900,000 square feet of parking space for staff and patients. Architecture firm TreanorHL led the medical side of design on the new hospital. SOM collaborated with TreanorHL on the design, and Cator Ruma and S.A. Miro, both engineering consultants, did the mechanical, electrical and plumbing work. 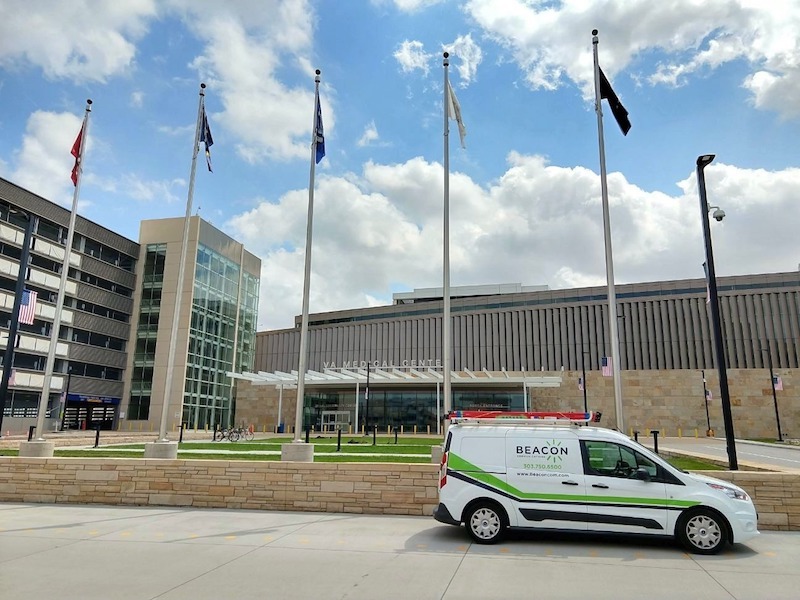 Beacon Communications, LLC, a full-service crucial communications and security solutions provider built a new BiAmp Vocia Distributed Audio System and the Rauland-Borg responder 5 Nurse Call System for the center — integrated and easy-to-use communication and audio systems that will help to provide the best possible patient care. 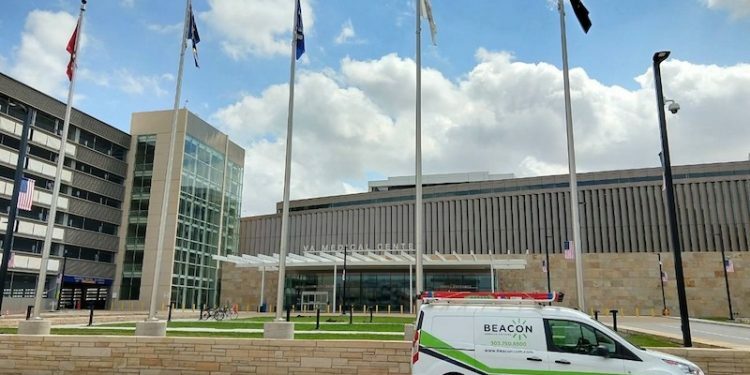 With more than 35,000 recorded man hours from Beacon Communications alone, Dan Amoroso, Beacon’s director of Pre-Construction & Engineering, admits that this project has been a big undertaking, but remains grateful to Beacon staff for playing their respective parts. “This project taught Beacon a lot. It taught us a lot about project management, handling the RFI process, and communication with contractors. As a group, this project taught us how to persevere; and it trained some of our key staff. There’s a long list of people that worked on this project; and they all learned key lessons,” said Amoroso. 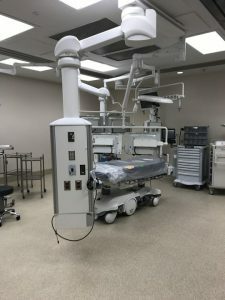 According to Beacon the project was expansive with buildings holding multiple specialty clinics, including Cardiology, Endocrinology, General Surgery, Oncology, Orthopedics and more. Other buildings were designed for Therapy and Rehabilitation. Still more buildings hold facilities for Veterans Support Services.